Rajiv Mohabir is the recipient of a 2015 PEN/Heim Translation Fund Grant for his translation of Holi Songs of Demerara, by Lalbihari Sharma. Read an excerpt of the translation here. I have always been haunted by the traumas of my creation story. I come from an East Indian, Guyanese community that was colonized, indentured, and forcefully displaced by the British East India Company from 1838 to 1917. The story of the overseer’s whip still cracks, still torments my family, albeit in steadily modernizing ways now that we live in the United States. One trauma is the gradual forgetting of our language and the taking of English as Eucharist. Our poetry recedes into the darkness of obscurity. When my friend Gaiutra Bahadur, who wrote about Lalbihari Sharma’s 1916 collection of songs in her book Coolie Woman: The Odyssey of Indenture, asked if I’d be interested in translating them, I jumped at the opportunity. I would be able to hear the poetry my ancestors most likely heard in Berbice, Guyana. I wanted to see what had survived the generations; what would be familiar, what would be new to my ear. These songs are Caribbean music and poetry—translating them is a journey into the realm of my ancestors. 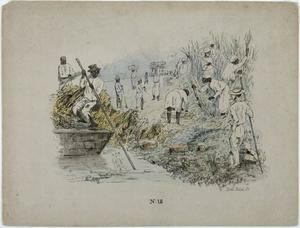 I attempt to piece together the fragments of story that still haunt my family today: the cane field, indenture, shifting landscapes of the familial and spiritual, dependency on colonial empires, and slavery under a new name. Even though my family is no longer fluent in Bhojpuri/Caribbean Hindi, its poetics leak into and permeate our lives now in English. My own forbearers were contracted in 1885 and 1890, and I wanted to know exactly how and from where each haunting emerged, crossed the thresholds of diaspora, and settled into our imaginations—distant as we are from that generation of voyagers. The accounts of British indenture displacing more than 3.5 million South Asians around the world come from historical documents and firsthand interviews long after the fact. Written during his contracted labor, exactly a century before I am writing this, Sharma’s poems are a personal account by a musician and poet who speaks the language of my poetic. I had to interact with Holi Songs of Demerara. It was necessary for me to connect to the oral traditions of chautal and other forms of folk music, seldom written down or collected. I was drawn to Sharma’s poems as a way to fight against the erasures of displacement, disenfranchisement, and the linguistic insecurities of non-standard Hindi in the diaspora, and as a way to measure my own poems against their ancestor. Rajiv Mohabir, winner of the 2014 Four Way Book’s Intro Prize (The Taxidermist’s Cut, 2016), the 2015 Kundiman Prize (The Cowherd’s Son), and the 2015 AWP Intro Journal award, is a VONA and Kundiman fellow. His poetry and translations appear in Best American Poetry 2015, Quarterly West, Guernica, Prairie Schooner, Crab Orchard Review, and Drunken Boat. He received his MFA in Poetry and Translation from Queens College, CUNY, and is currently pursuing a PhD in English from the University of Hawai`i, where he teaches poetry and composition. Lalbihari Sharma was born in Chhapra village in the United Provinces of India (now Bihar, India). Sharma was indentured by the British East India Company to work the sugarcane fields and published his chautal folksongs in 1916. A musician and singer, he is the first Indo-Caribbean writer to write and publish one of the only books written in the dialect of his village. Not much is known about his life other than the autobiographical information included in his work. This piece is part of PEN’s 2015 PEN/Heim Translation Series, which features excerpts and essays from recipients of this year’s PEN/Heim Translation Fund Grants. This translation is available for publication. Publishers and editors who wish to express interest in this project are invited to contact PEN Literary Awards Coordinator Arielle Anema ([email protected]) or Translation Fund Advisory Board Chair Michael F. Moore ([email protected]) for the translator’s contact information. Disinformation campaigns are now being waged by foreign AND domestic actors. "If the Cuban government really wants to support and elevate the cultural sector, creating a new generation of cultural inspectors does not inspire any kind of trust," Laura Kaurer, administrator of Artists at Risk Connection (#FF @AtRiskArtists), told @elnuevoherald.